OK, I admit it. I’m an over thinker. I can’t help it. It is how I arrived way back when. So to distill my life into a six word memoir is harder than I thought it would be. There are so many different directions it could go. And the thought of casting my six-word memoir out into cyberspace—where words never disappear—became more and more daunting the longer I thought about it. Yes, that is the “over thinking” thing popping up again. I tried to come up with a memoir that was lighthearted and meaningful that I could connect to something in my life. Hmmmm . . . what could it be? But memories are an unruly thing. Lighthearted is not where my memory train stopped. Instead my mind turned to another moment in my life when I had to decide on just a few words to describe the indescribable. Corey, my fourteen-month-old son, had just died from a head injury after falling off the swing in the back yard. I picked out a tombstone. I didn’t want a tombstone, and I sure didn’t want one with my son’s name on it. They asked if we wanted to add anything besides his name, birth and death dates. How could a few words possibly capture what my son meant to me? Finally I mumbled “Our beloved son.” Three words that can never scratch the surface of the love I still have for my son, and the devastation of his loss. How does this melancholy memory connect to writing this blog? I began writing only after Corey died. If he had not died, I would never have written a single word. After his death I knew I was supposed to write a book about my experience. My first book titled Forgiving God is a Christian inspirational book about the Spiritual battle I faced after Corey’s death and how God brought me through it and back to Him. After that, I began writing nonfiction books for young readers. Life’s a gift, treasure each day. Oh, Carla, I am so sorry for your loss.! I am thankful that it has propelled you to write and to help and inspire others. What a powerful read. Thank you so much for sharing this wisdom. I love your memoir! 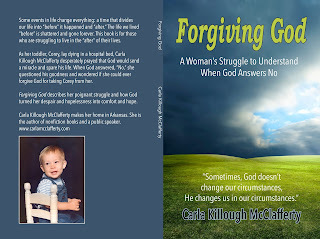 Carla, thanks so much for sharing your story, and your wonderful memoir with us. Thank you for this, Carla. 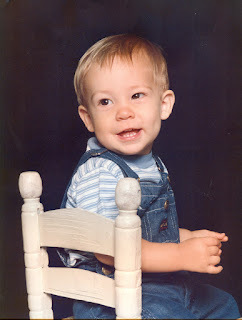 My son Ben died after an accident at age 13 months, just a few months before your beautiful boy was born. Reading your post touched me, and I admire your courage to share your experience. What a difficult experience to share, and how beautifully you shared this, and your six-word memoir, thank you for all! It takes a special strength, one from God, to get through such a tragic loss. You teach others through your words. Love your six words. They are just right! Thank you for sharing this heartbreaking and life changing loss. I am so moved by your resilience. Your six words are perfect. I am still over-thinking mine. Dear Jane, Bobbi, Carmela, Buffy, Michelle, Margaret and Liz. Thank you all for your kind comments. I appreciate them. There are many days, still, that I need to remember my own six-work memoir. You, Carla, and this post are both gifts. Love your six words! They are so true. Esther, that is such a sweet thing for you to say. You are one of those people that have inspired me in the business since the day I met you. Thank you! Ina Raye, thank you for your support and encouragement. I appreciate it. Carla ~ you have demonstrated, in sharing with such depth, what a powerful tool words can be. Thank you, thank you. April, thanks for you comment. It is powerful that words can bring both laughter and tears.